Until the 1950s, Breitling was best known for its aviation-focused watches. But, amidst the 1950s heyday of dive watches, Breitling introduced the Superocean: a bold declaration that Breitling was ready to take up the challenges of designing and perfecting diving watches. We take a look at the history of the iconic Breitling Superocean and how it beat out its diving watch competitors. Founded in 1884, Breitling had long established itself as a premier watchmaker. Founder Léon Breitling had perfected his intricate and complicated design which even impressed his watchmaking contemporaries. After his death, Breitling’s best-selling chronograph was frequently worn by military forces and police officers. After World War I, with Léon’s grandson Willy at the helm, Breitling made a big push to become the watch of choice for aviation crews. The Swiss watchmaker focused on manufacturing watches that allowed pilots to quickly calculate flight speed and distance. During this innovative time, Breitling debuted the Navitimer collection which featured a slide rotating bezel that made the crucial in-flight calculations (like fuel consumption and air speed) even easier for pilots. Ultimately, Breitling won the bid to supply watches to the Royal Air Force. With their aviation reputation firmly established, Breitling turned its focus toward diving watches. In the 1950s, dive watches were incredibly popular. Competitors like Rolex and Omega had put their dive-watch stakes in the ground: the Omega Seamaster broke its first diving record in 1955, reaching depths of 62.5. Meanwhile, Rolex debuted the Submariner in 1953, which was waterproof to a depth of 100 meters. In turn, Breitling released its Superocean in 1957. The Breitling Superocean touted its water resistance of 200 meters, which impressively beat out its contemporaries. The Superocean’s clean and practical design also featured large Arabic numerals and oversized hands to make it easier for divers to read. Since its debut, the Breitling Superocean has been fine-tuned to withstand deeper depths and, on select models, is water resistant up to 2,000 meters. The diving watch now features a helium valve that allows the watch to withstand the incredible underwater pressure without exploding. Breitling has also expanded the look of the Superocean, now offering the diving watch in more colors and different case sizes. In 2007, Breitling commemorated the model’s 50th anniversary with the Superocean Heritage Collection. The Superocean Heritage pays homage to the inaugural Superocean with its braided steel bracelet and Breitling even brought back its 1950s logo for this collection. But in step with modern tastes, the Superocean Heritage is available in a 38 mm or 46 mm case size in several different colors and three different bracelets: rubber, leather, and steel mesh. The Super Ocean is a great durable watch for diving . I fell in love with mine right away . 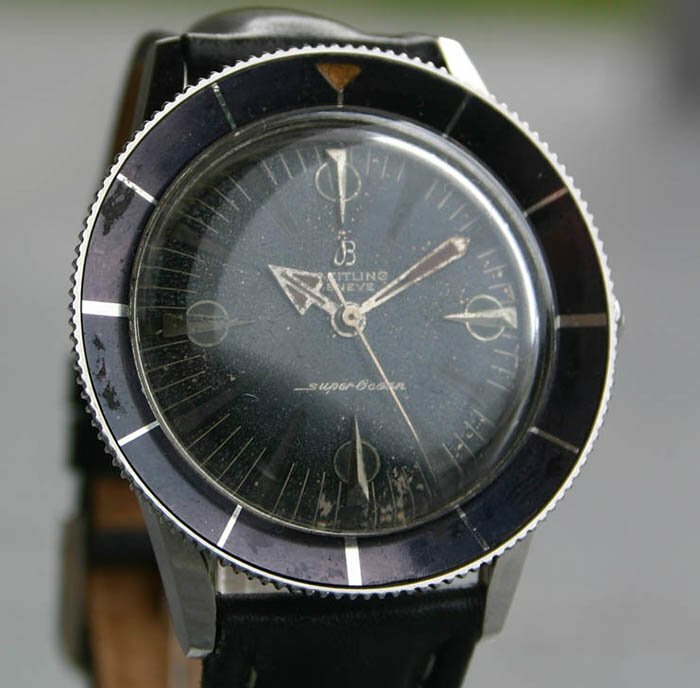 It was the first breitling I ever owned .